PINKO my second total look | Cosa Mi Metto??? Someone had pulled at random, someone else had a good intuition.. there have been many ideas.. From the details that I had shown someone guessed something.. but tell me the truth, was that the way you had imagined my second PINKO total look? If you want you can have a closer look today at PINKO CHRISTMAS COCKTAIL PARTY at the store in Naples from 18:00, I'll be waiting for you! Last but not least: Luca is turning 33 today, HAPPY BIRTHDAY MY LOVE!!!! Qualcuna aveva tirato a caso, qualcun'altra aveva indovinato davvero..tante sono state le ipotesi.. Dai dettagli che vi avevo mostrato qualcuna era risuscita a indovinare qualcosa..ma dite la verità, era così che vi eravate immaginate il mio secondo PINKO total look? 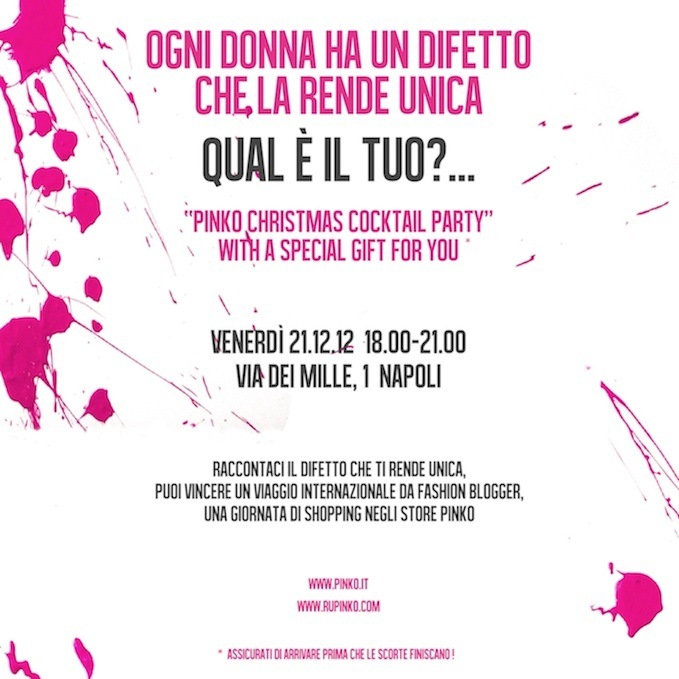 Se volete potete vederlo da vicino oggi al PINKO CHRISTMAS COCKTAIL PARTY allo store di Napoli dalle 18:00, vi aspetto! Ultimo ma non per importanza: Luca compie 33 anni oggi, TANTI AUGURI AMORE MIO!!!! If you need more details about the R U PINKO contest, you will find everything at the end of this post. Se volete conoscere tutti i dettagli del contest R U PINKO, li troverete alla alla fine di questo post. Please remember that comments will be considered valid only if posted on Nardelli Gioielli's wall on facebook! Per favore ricordatevi che i commenti verranno considerati validi solo se postati sulla bacheca facebook di Nardelli Gioielli! Tu sei sempre molto bella e Pinko ha sempre capi eccellenti. Molto elegante! Non saprei dire cosa mi piace e cosa non mi piace di questo look. È tutto ben equilibrato. Lovely look, beautiful dress! xoxo A.
Mi piace molto il vestito, stai davvero bene fabry! Love it!!!! look very special!!! I like the way how you combined everything, my favourite piece is definitely the clutch, it´s gorgeous!! Adoro Pinko!! !il vestito e' davvero molto bello! amazing outfit dear! love the clutch! Che bella che sei .. adoro il dettaglio dei guanti e il vestito é favoloso ..
wow awesome outfit! i loved the dress in the first photo and then i saw the coat and loved that even more! You look absolutely wonderful and chic!! Stai davvero mlto bene!Mi piacciono molto gli stivali!! Stai benissimo con questo vestito! E tanti auguri a Luca! Nice outfit. I totally love your coat. non vedo l'ora di vedere questo outfit dal vivo!!! Stivali fantastici Fabri, li adoro! Ciao Fabrizia! Che bel look caldo! Mi piace molto l'abito ed il cappottino! Elegantissima! Un bacio e buona giornata! Love the dress & all the buckles on your boots! I love your dress! This outfit look suits you very well. Impresionante conjunto y grandes complementos. Love this looks!!. it has beautiful details as on the hat and the gloves!. great choice. Bellissima Fabri :) adoro questo look :) e facciamo tanti auguri a Luca allora!! Sei sempre molto bella! Un bacio cara. Great Style!!! I love th dress... it looks so great on you! So, so pretty! Love the dress! Sei meravigliosa, adoro il cappello! love love love the bag! adore it! PINKO is so nice. Lovely outfit. PS: Liked your blog on Facebook. PINKO is just so nice. You look very beautiful. P.S. : Liked your blog on facebook. Would appreciate it if you could like my page back. I absolutely adore the coat, the dress, the bag, the hat, everything! this is an adorable winter outfit! i've been wanting similar sunnies too! Really lovely outfit! Cute hair! il colore del vestito mi piace da morire!! I love everything about this look – that dress is so cute, and that's an awesome jacket! molto bellina tutta in pinko! You look so gorgeous, as per usual! I love everything about this look but I particularly like your coat! It is soooo beautiful! This dress is gorgeous, I love it! Bellissima:) molto bello il cappottino con la cintura( l'hai aggiunta tu oppure è proprio parte del cappotto?) molto carina davvero!